Watch This is a regular series where I find a YouTube video that shows neat tricks or tips for our hobby. From painting, building, or photography, I will be looking for great videos for you to watch and write up a brief summary of the steps used. This week brings a video from Tabletop Minions with Sam Lenz. 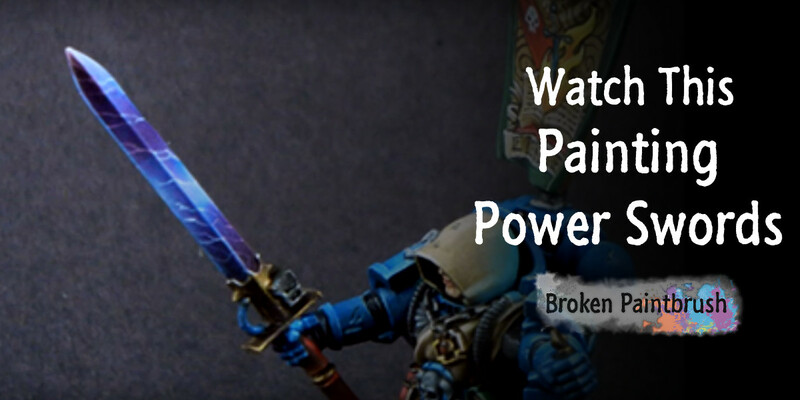 He gives a great step-by-step look into how his method of painting power swords. It’s a mix of Non-Metalic Metals with lightning effects and lots of brush licking*. While Sam adds way more steps and blends that may be needed for most of my painting, his method seems pretty straight forward. But simple does not imply simple looking. By applying patients and just a few different colors of paints, he was able to create a spectacular effect. I hope you enjoyed this week’s Watch This on Painting Power Swords and that you may have learned something from it. If you liked Tabletop Minions, check out their channel on YouTube and give them a follow. Do you have a YouTube video you think I should feature here? Let me know in the comments below. Also, if you want to get more hobby goodness in your inbox, sign up for the Brush Stroke, my weekly newsletter where I send links to some great hobby articles to improve your skills.